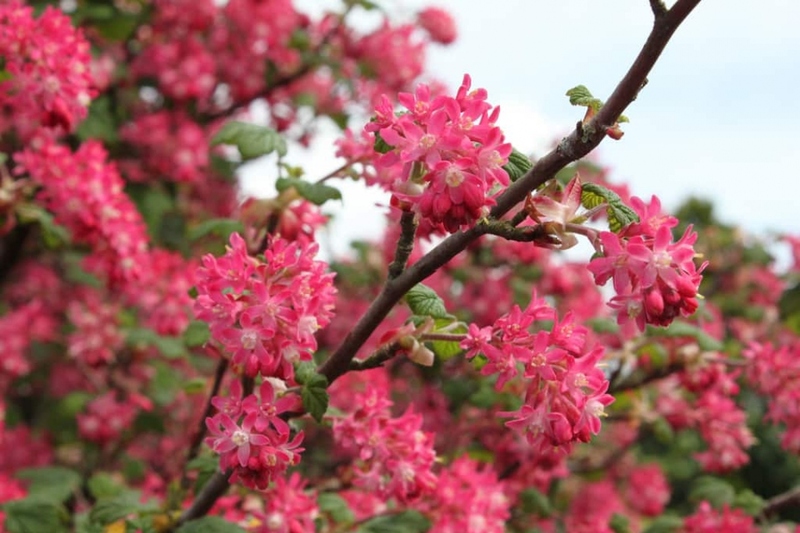 Flowering Currant (Ribes sanguineum): growing, planting, caring. Ribes sanguineum, the flowering currant, redflower currant, or red-flowering currant is a species of flowering plant native to western United States. Redflower currant is a deciduous shrub growing to 2.5 m (9 ft) tall and broad, with leaves 2–7 cm (1–3 in) long and broad, palmately lobed with five lobes, and flowers produced in early spring right when leaves emerge, on dangling racemes 3–7 cm (1–3 in) long of 5–30 flowers. Each flower bears five red or pink petals. The fruit is a dark purple oval berry, edible but with an insipid taste - but the birds will have it if you don't ! You can plant from October to March for redflower currant in bare roots, and until May for seedlings in containers, but avoiding the maximum periods of frost. The redflower currant likes exposure in full sun, not scorching. It can eventually support the semi-shade, especially if it is leaning against a wall that will house it and keep it warm. It will prefer a rich soil. In a furrow 8-10 cm deep, bury the green shoots of the young suckers. In hedge, plant every meter. Thin the soil when planting with compost. Warning: Do not bury the small line that forms the boundary between roots and branches of the plant, it would slow down its growth. Unlike other berry producing plants, gooseberry bushes require quite a bit of water, especially during the first weeks after planting, and during the fruiting period. This need is even greater is they are kept in pots or experience periods of drought. Keep a moist substrate, but most importantly cover the roots with mulch. Depending on the quality of mulch, you may only need to add more on rare occasions. Prune only once every two years, shortening each branch by one-third of its length. This must be done after flowering, in May-June. Redflower currant is quite resistant to diseases! You can however be confronted with powdery mildew - white foliage on all or part of the plant and especially on the leaves may appear - with rust - orange-brown pustules under the leaves - with the aphids - the leaves curl and lose their color of origin - and mealybugs. Against powdery mildew, you can curatively treat with a decoction of nettle manure: there are even today nettle manure in garden - 100% organic! Aphids feed mainly on leaves, especially during spring. To fight against aphids, adopt some ladybugs! There are many ways to get rid of it, however, avoid the method of spraying a solution of soaped water on fruit trees.